(Nanowerk Spotlight) Nanopaper, made from cellulose like traditional paper, shows much lower surface roughness and much higher transparency than traditional paper. This is due to the nanoscale dimensions of the cellulose fibers ('nanocellulose') used for its production. Nanocellulose is a sustainable material that can be extracted from plant cellulose pulp or synthesized by certain bacteria. Nanocellulose has been explored in various fields, including filtration ("Nanocellulose filter cleans dirty industry"), wound dressing, as replacement for toxic dyes in textile or security applications, as sponges to combat oil pollution, or as substrate material for flexible and transparent electronics. 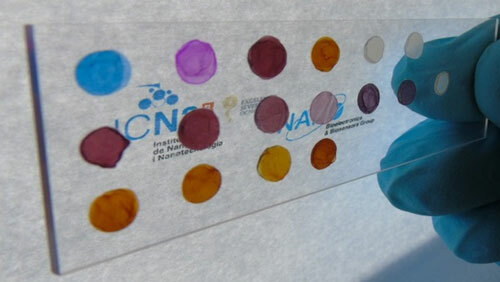 "To date, bacterial nanopaper has been scarcely explored for optical (bio)sensing applications," Arben Merkoçi, ICREA Research Professor and director of the Nanobioelectronics & Biosensors Group at Institut Català de Nanociencia i Nanotecnologia, tells Nanowerk. "Hence, we sought to design, fabricate, and test simple, disposable and versatile sensing platforms based on this material." In a new paper, published in the July 2, 2015 online edition of ACS Nano ("Nanopaper as an Optical Sensing Platform"), Merkoçi and his team describe various nanopaper-based nanocomposites that exhibit plasmonic or photoluminescent properties that can be modulated using different reagents. "For the first time we report various nanopaper-based optical sensing platforms and describe how they can be tuned, using nanomaterials, to exhibit plasmonic or photoluminescent properties that can be exploited for sensing applications," say Eden Morales-Narváez, a postdoctoral researcher in Merkoçi's group and Hamed Golmohammadi, the paper's first authors. "We also describe several nanopaper configurations for simple devices, including cuvettes, plates and spots that we printed or punched on bacterial cellulose nanopaper." The sensing platforms include a colorimetric-based sensor based on nanopaper containing embedded silver and gold nanoparticles; a photoluminescent-based sensor, comprising [email protected] quantum dots nanocrystals conjugated to nanopaper (which can be photoexcited using UV-visible light); and a potential up-conversion sensing platform constructed from nanopaper functionalized with NaYF4:Yb3+@Er3+&SiO2 nanoparticles (which can be photoexcited using infrared light). 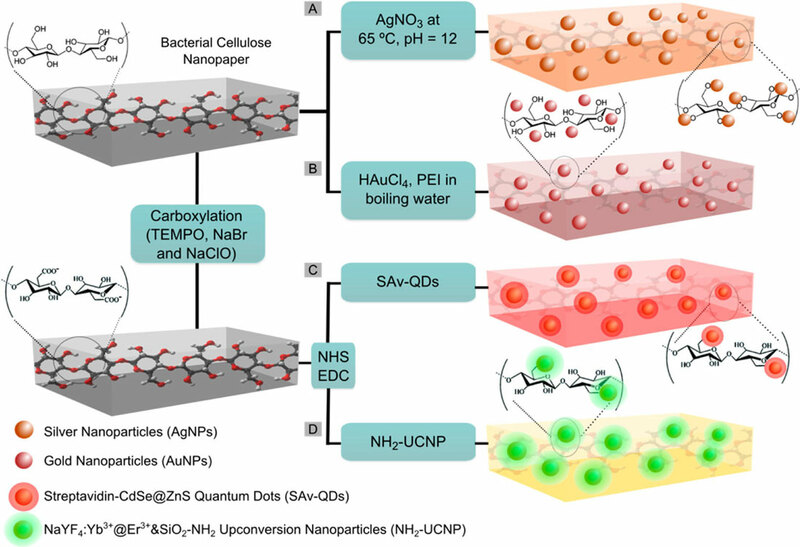 "In all of these approaches, we took advantage of the optical transparency, porosity, hydrophilicity, and amenability to chemical modification, of bacterial cellulose nanopaper," note Eden Morales-Narváez and Golmohammadi. "We expect that these novel platforms will pave the way to new optical (bio)sensors or theranostic devices that are simple, transparent, flexible, disposable, lightweight, miniaturized and perhaps wearable."